While the PC market feels glacial compared to the smartphone market, there’s one niche that keeps buying new and expensive devices. Many PC makers have dedicated gaming divisions and now Samsung wants a piece of that action. The result of that is the new Odyssey series that even has its own logo. You can see it on the lid (in its red backlight glory) on the first two laptops - Odyssey 15 and 17. We spent some time with the bigger model, basking in the RGB light of its keyboard. This is exclusive to the 17.3” model where you can pick the color of each key (the 15.6” model has to make do with a fixed red backlight). The keypad, by the way, promises 2.5mm key travel and volcano keycaps. 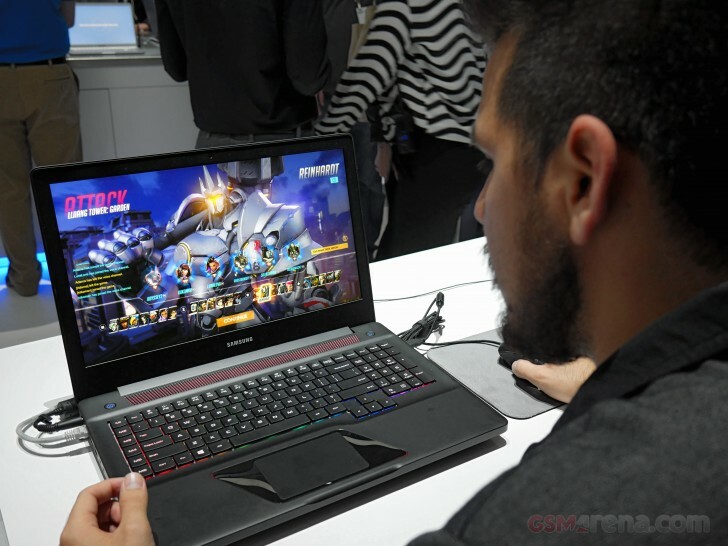 The touchpad is surrounded with light too but there’s no RGB here, though, just R.
Another exclusive to the larger laptop is the Beast Mode button, which kicks the hardware into high gear (it seems that Samsung is considering changing the name, however). 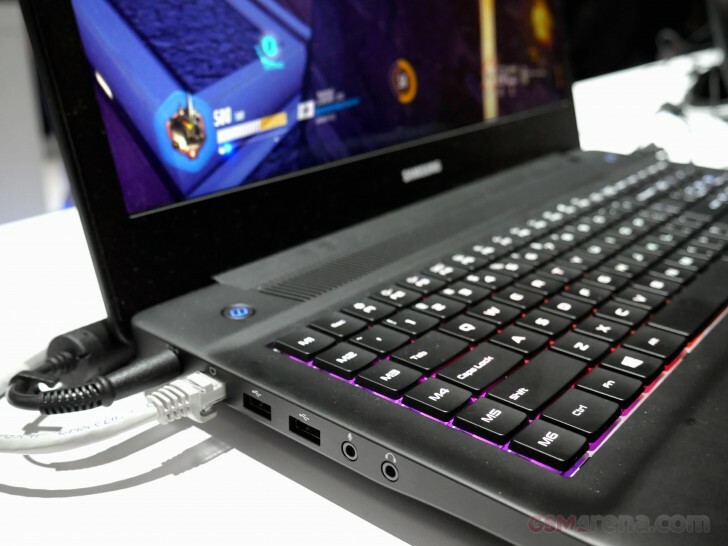 In its capacity to put on a light show, the Samsung Odyssey laptops are true gaming hardware. It terms of actual gaming hardware, however, things are less certain. We wish we could tell you if the 17.3” model deserves a “Beast Mode” button but Samsung is mum on what kind of GPU is inside. We do know that the 15.6” model will use the Nvidia GTX 1050, which is more Leagues of Legend class GPU rather than something that runs The Witcher 3 in VR. Whatever the GPU, at least it won’t have to drive a high resolution display - Samsung used matte 1080p displays for both laptops. The smaller one will start at $1,200 the price of the 17.3” model that we looked at is still TBD. At least Samsung didn’t skimp on the CPU side, both laptops are powered by Intel Kaby Lake processors (up to Core i7 quad-core, 45W TDP). You can equip it with up to 64GB of RAM spread accorss 4 SODIMM slots (up to 32GB for the smaller model, 2 slots). The Odyssey 17 also has tons of storage - if you go all out, it will fit two PCIe SSDs and an HDD. The laptop itself also weighs a ton - 3.79kg. When we tried lifting it, something else made an impression - how flimsy the plastic body of the laptop is. You do get a 93Wh battery, but a 2015 MacBook Pro 15 had a 99.5Wh battery and weighed only 2.04kg so you can’t blame the battery for all that heft. And the Odyssey 15 has only 43Wh battery and weighs 2.53kg. It seems that Samsung is aiming for the middle ground between the most affordable gaming laptops and the premium names in the business. You can have a 15” 1080p screen and Nvidia 1050 for $900, even an Asus ROG with similar specs is cheaper than Samsung’s offering. 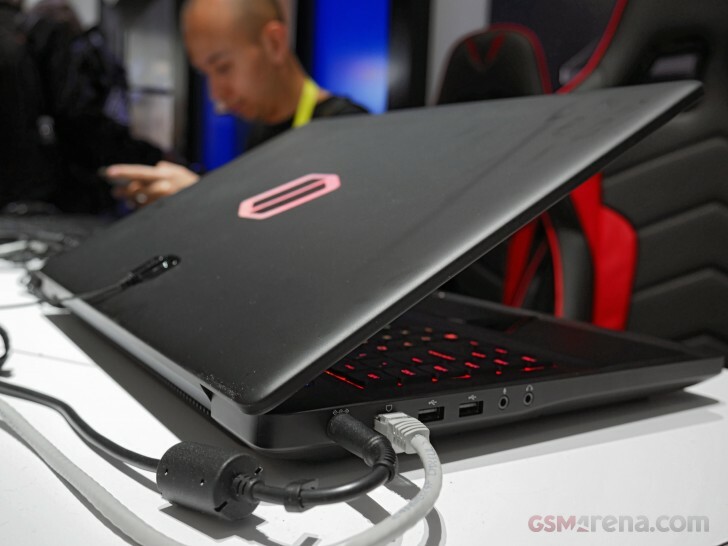 We don’t think the Odyssey will become the Galaxy S of gaming laptops, at least not this first-gen hardware. So I was talking about 15 inch model lol simple. But do you know what a 17" blade pro packs?.